It's sad to see a tragedy that happened to the 19 firefighters who died while battling a fast-moving wildfire menacing a small town in central Arizona. 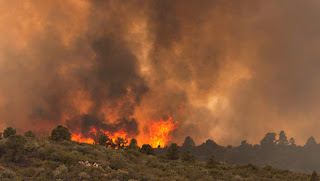 US Wildland Fire Aviation service reported on Sunday, according to report by Reuters. US Wildland Fire Aviation posted on Facebook that the firefighters perished in the so-called Yarnell Hill Fire, near the small town of Yarnell about 80 miles (128 km) northwest of Phoenix. Arizona Police did not disclosed immediate details on the situations of the 19 firefighters who killed in Arizona blaze. Associated Press told that there are 200 firefighters are fighting the fire, which has destroyed several homes in the community. Comments or suggestions about "19 Firefighters died in Arizona blaze" is important to us, you may share it by using the comment box below.